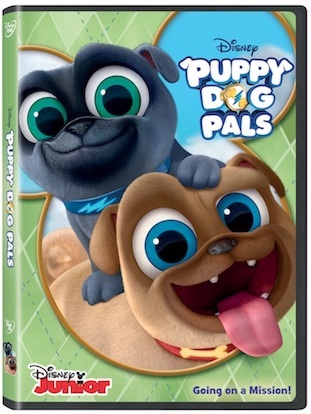 From the adorable Disney Junior series Puppy Dog Pals comes a fun DVD filled with plenty of adventure with two of the most cuddly little pug pups: Rolly and Bingo. They live with their owner Bob, an inventor who creates some amazing things for the pups to play with, and their doghouse is more like a doggy playhouse. These fun-loving pooches also have “big sis” Hissy the cat to keep them company, although she often balks at what they want her to do. And Bob invents ARF, a robotic dog that joins the family. This house is filled with plenty of antics when Bob is away at work. Bingo and Rolly adore Bob and never want to disappoint him, so when he mentions that he would love to squish his toes in Hawaiian sand, well, the pups decide to go to Hawaii to retrieve some genuine Hawaiian sand for their owner. And yes, they do manage to get to Hawaii, win a surfing contest, and get back home in the same day. And when Bob is out of the makings for French toast, where do you think the canine siblings decide to go? You guessed it. They travel to Paris to bring back what Bob loves for breakfast. When ARF is introduced to the household, Bingo and Rolly are excited to know he is there to clean up their messes so when Bob comes home he will have more time to pay with them. Well, what they don’t know is that ARF is not programmed to clean up after himself or Hissy, and guess who makes the most mess? Well, after some good deeds on their part, Bingo and Rolly set things right, until they discover they put too much soap in the washing machine. But that’s all right. Since the mess is theirs, then ARF will clean it up. Everything works our well in the end. Then there’s the time Rolly and Bingo destroy Bob’s precious childhood stuffed dog so they take him out to get him fixed at a Doggie store, which is like a Build-a-Bear. They manage to stitch up the dog just like new and during their time at the store they end up at a (stuffed) doggie tea party, and dressed in high-tea fashion. These and more fun adventures are included on this disc. With plenty of music and adorable characters, this show is a delight for viewers of Disney Junior and now with this DVD kids can watch the playful pugs any time they want. There are six episodes included on this DVD; each episode has two stories, so there are twelve different whacky adventures with Rolly, Bingo, Hissy, Bob, and ARF on the disc. Let your kids “go on a mission” with these wonderful pooches. Don’t be surprised if they start asking for a pug of their own. Puppy Dog Pals is rated TV-Y for everyone.